The LADC is preparing to close for renovations over the semester break. 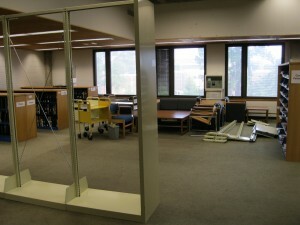 All of the journals are boxed and located upstairs, their shelves have been removed, and the reference collection is also boxed up. 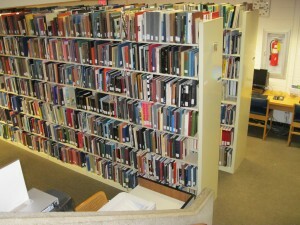 Reference & video collections will be moved into the gallery beginning Dec. 7. 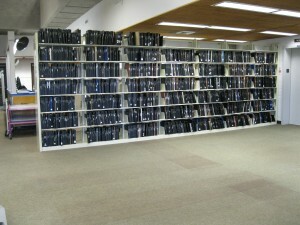 The slide collection is being moved over to the main library for storage. These items are still available for use, though not in their traditional places on the shelf, so please don't hesitate to ask us for help finding materials this week. We are open for extended hours this week for finals, and have kept study tables and chairs available downstairs. The LADC will close for renovations at the end of the day Friday, December 7 and reopen on Thursday, January 3. Faculty, staff or students needing items from the LADC between December 8 and December 19 should contact LADC staff through email at lib_architecture@auburn.edu or via telephone 334-844-7849. We will pull requested materials from LADC and bring them to RBD Library each business day beginning December 10. Patrons will be notified when their items are ready for pick-up at RBD Library’s circulation desk. Access to LADC materials will be unavailable when the University is closed between December 20 and January 2. During July and August, you may notice changes as we install new carpet and paint upstairs. This first phase of the LADC's renovation is scheduled from July 9 to August 24 (but we hope to finish by August 16th). 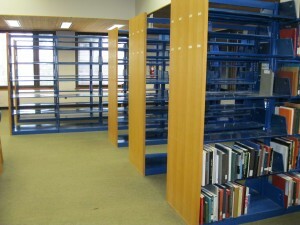 The process will involve moving books onto temporary shelving located on the ground floor and in the CADC Gallery, before the work of carpet installation and painting is to be completed on the 2nd floor from July 16 to August 3. The assembly of temporary shelving is under way, and the shifting of books from upstairs began this week (see photos below). We plan to have all of the books assembled in call number order on the temporary shelves (and the shelves marked with call number signs) by next week. Although the stacks will be marked, they might be difficult to navigate, so we will be happy to help you find anything you need. 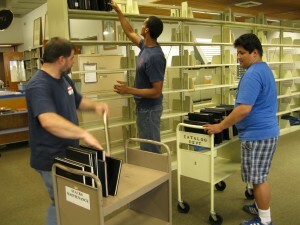 LADC staff and student employees will also be able to retrieve books on demand during the move. Temporary shelving for the theses being assembled. The shifting begins! Theses are being consolidated to make room for more temporary shelving. The temporary location of the theses. Two temporary stacks assembled on the ground floor for books from upstairs. Empty shelving upstairs. The books are being shifted to the ground floor to prepare for new carpet upstairs! 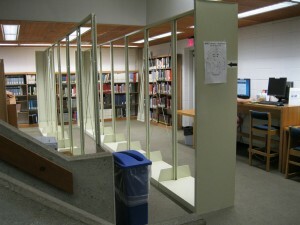 Temporary location of books A 1 - NA 1011. Please let us feature your project or research! Email us your work & any comments about it.